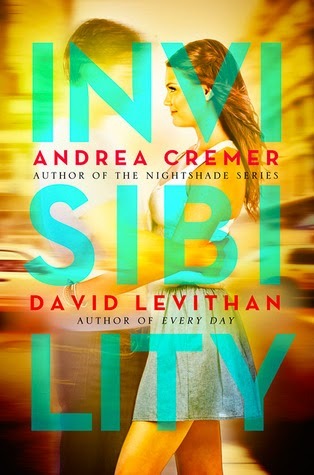 To be honest, I wasn't really expecting to like Invisibility when I started it. I disliked both Cremer's and Levithan's previous work that I had read. But I liked the unique premise of Invisibility so much that I had to give it a try. Sadly, it didn't work out for me. My major problem with Invisibility is the characters. Stephen is gloomy and has zero self-esteem. It always felt like he was having a pity party. Sure, being invisible all your life is tough, but couldn't he at least have a personality? And when he wasn't being sad and depressing, he was talking in this poetic style that didn't feel like a teenage guy's voice at all. I hoped I would like Elizabeth, and although she was definitely better than Stephen, I ultimately didn't care about her. It didn't make sense for her to be so in love with Stephen. Which brings me to my next problem: the insta-love. Really? They see each other and fall in love in less than a hundred pages? By the end, Elizabeth is willing to sacrifice pretty much everything to save Stephen and be with him. Um...she barely knows him! Lastly, I didn't like the plot. It felt like Invisiblity had no idea what genre it is - contemporary, or paranormal? The first third was all sappy romance and poetic ramblings, and then it turned into a big jumble of magic and curses. First insta-love, then a clichéd paranormal storyline. *sigh* I really didn't care for this at all and I don't think I'll be reading any more books by either of these authors. I'd only recommend Invisibility if you're a fan of Cremer or Levithan.